More than ten years ago I travelled on a railtour organised by F&W railtours, which was intended to take a class 40 from Birmingham to East Anglia. Running via Gloucester, Swindon and the North London line, the route was up to Norwich, across to Lowestoft, down to Ipswich and back along the outward route. The tour was probably best described as a disaster. It ran in January, on one of the coldest days of the year. As a result, the intended 40 was frozen into its siding at Bescot. The replacement had no heating capability, so that we eventually ran double-headed by the 40 and a 46, but more than two hours late. An engine change at Stratford - to a single class 31 - meant more delay, likewise the performance of the 31. Obviously the problems were not the fault of the organisers, and it is to their credit that we were given a free re-run of the tour in September that year - returning from Lowestoft via Ely and Melton Mowbray. In this case, everything ran according to plan - a most enjoyable trip. The "Wensleydale Wanderer" ran on bank holiday Sunday 27th May, organised by Pathfinder tours. The basic idea was to travel along the Wensleydale line from Northallerton to Redmire - the surviving 22 miles of the former through route to Garsdale, formerly Hawes Junction, on the Settle and Carlisle. An interesting route was promised in both directions from Birmingham to York, with two class 31s as motive power. What has this to do with the "East Anglian"? "The special is running 50 minutes late, lads" announced the solitary BR. representative on duty that morning. "The stock was two hours late going down from Edge Hill." "Edge Hill? This train starts from Bristol!" "All the charter stock comes from there now. We had a Women's Institute special to Liverpool recently. The stock for that run made the round trip twice!" He then retired to his office, and shortly the mouthwatering aroma of frying bacon wafted across the platform - not very diplomatic. About ten to nine he re- emerged. "Its reported running 80 late now, I'm afraid"
It may occur to those readers who have got this far, that this article doesn't seem to be getting anywhere. That is basically how we felt, at half past nine on that gloriously sunny morning. Five minutes later, the train arrived, and we were away! Our jubilation was short lived. As advertised, the train arrived hauled by class 31s, 568 "The Engineman's Fund" and 423 "Jerome K Jerome" - the locos named at the recent Bescot open day. They managed to haul the train as far as New Street, where they were removed, to be replaced (eventually) by a pair of 37s, 244 and 217. Apparently, 31 423 was suffering from fuel starvation. "We'll be OK now, Steve" I suggested. "These two have much more power than the 31s". They didn't seem to have a lot more power. Our route was via Lichfield, and the climb through the Birmingham suburbs was somewhat laboured. We then headed through Derby (where D100, resplendent in green livery, stood in the yard) towards Chesterfield, and continued to make less then startling progress. On being stopped on the freight loop south of Ambergate, the crew jumped down and began an examination of the second loco. This time, the story which spread down the train was that the second loco had not been doing anything apart from ticking over merrily. After three northbound trains had passed us, we restarted, this time with the sort of acceleration that 3,500bhp ought to be able to provide. A quick check of the mileposts just south of Clay Cross revealed 41 seconds to a mile - around 88 mph! I couldn't help feeling sorry for the people joining the train at Chesterfield, our last pick-up. Due at 1017, we arrived at 1222. Our path now followed the direct route towards Rotherham, normally freight only. At Treeton junction we turned left into Tinsley Yard, a potential feast for the number crunchers. Another green 45 lurked behind a line of wagons, while several of its doomed brethren - 033, 120, 130 and 150 - stood with condemned 47s and 20s. Turning right at Shepcote Lane East Junction, we followed the line through Rotherham Central, then across to the Midland line again at Aldwarke. The layout here is much simplified - the northbound crossover from the Midland to the GCR has been removed, replaced by the re-instated Swinton curve a few miles further north. Our train followed the direct route north through Pontefract Baghill and Church Fenton (where the lovely old wooden station buildings have been completely removed), to come to a rest in the loops south of Holgate Road bridge at York. Just a few minutes earlier, we had passed the unique 89 001 "Avocet" heading south light engine - my first sighting of electric traction on this stretch of line. "Avocet" had hauled the "Modern Railways 500" "Dinex" from Kings Cross. We had in fact pulled in alongside its empty stock of Intercity MkI Firsts, which put our decidedly tatty stock to shame. This tour, organised by Hertfordshire Railtours, was due to be hauled from York to Leeds via Harrogate by D7672 "Tamworth Castle", the effectively preserved class 25. Its departure from York was to be 1700 - our itinerary suggested that we could see it later. Huh! More fun and games, and attendant rumour followed. 47 476 stood nearby, and duly attached itself to the rear of our train. The intention was that it would be hauled behind us to Northallerton, where it would then haul our train (and the 37s) to Redmire. The trailing connection to the Wensleydale branch lies north of Northallerton station, The usual routine for the stone trains, the lifeblood of the branch, is to reverse down the main line, then head up the Stockton line to the Tees-side steel works. Passenger trains formerly used a facing connection, since removed. Obviously, use of this connection by the stone trains would have necessitated running round. As a train spotter in the early sixties, I spent many a happy hour at the south end of Northallerton's up platform. This was the best position to get the numbers of the "bottom liners" on the freight route through Boroughbridge Road level crossing, down below the station, taking goods to and from Tees-side. Every now and then - perhaps two or three times a day - we would notice a brake van heading along the up line towards us. This was the signal for a sprint along the platform, through the subway and along to the far end of the down platform. If we were quick we would get the number of the loco (a WD 2-8-0, or a K1 if memory serves) before it hauled its train away down the Stockton line. We stood at York for nearly half an hour. The rumour which spread this time was that the Traction Inspector had gone home (fed up with waiting). Then he was at Northallerton, in error. Whatever the true situation, we eventually pulled out, only to be halted by the guard just as the 37s, still pulling, fouled the main line. A sprinter, heading for the station, was now trapped by our train at the signals alongside our 47. After five more minutes, its driver jumped down and entered the cab of the 47, just as we began to move again. He nearly got a free ride to Northallerton! An uneventful run followed, through the yards and past the carriage works, then up the main line to Northallerton and Castle Hills Junction. A few minutes later and we were on our way down the branch, two hours and 35 minutes late! This part of the tour was quite deservedly the highlight. Built in several stages, the station buildings showed a remarkable variety in architecture. Many of them are still extant, along with some of the signalling and signal boxes. 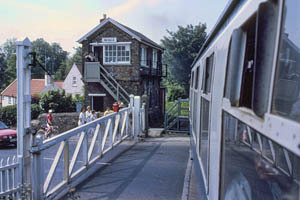 Some of the stations - such as Bedale and Leyburn - are still fully usable, and have seen some excursion traffic in recent years. There is currently a plan to reconstruct the remainder of the branch to Garsdale - what a nice thought! No photographic stops or detraining are allowed officially, the itinerary stated. Nevertheless, we were allowed out at Redmire, onto the track, for a welcome leg stretch and a few snaps. The journey along the branch had taken nearly an hour and a half, largely because of all the level crossings, and the return journey took a similar length of time. A long halt followed at Castle Hills Junction, before we could head southwards again to York, where we had half an hour to wait while the train reversed. We had originally been scheduled for an hour in York, so on leaving at 1933 we were only (!) just over two hours late. We headed now for Leeds, via Harrogate - a route I had traversed many times, but very popular with many of the tour's participants. On arrival at Leeds we expected to be sent direct towards Wakefield, but instead we pulled into the station, where the 37s were removed. A pair of 31s, 459 and 428, lurking near the end of the platform, were then attached, and formed our motive power for the remainder of the journey. We now headed for Wakefield Kirkgate, passing through the station and taking the L&Y Barnsley line at Horbury Junction - more new track! Joining the Midland route again at Wincobank Junction, we were soon in Sheffield, where we stopped for little more than seconds - less than 2 hours late now. The route from here was conventional, apart from the outward diversion via Lichfield. Hardly any delay at New Street - the place was almost deserted - before we were away again, and soon we were back at Stourbridge Junction, arriving just 2 hours down at five minutes past midnight. Once a special becomes late, the problem is that of fitting in to the existing schedule - the worry was that "Pathfinder" would become path loser!. It was clear though that the problems were not of the organisers' making, and it was to their credit that the route was not altered at all - no short cuts this time! The time of year meant that we were in daylight apart from the last couple of hours - the long hours of darkness are always a problem with late running winter tours. In conclusion, the trip was only marred slightly by its lateness, and overall it was still an excellent day out!